jamx is an "easy to use" netpd sequencer abstraction. 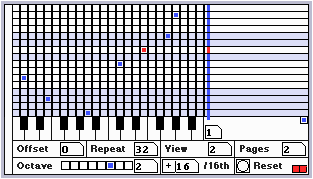 monophone midi notes can be set with additional ctrl-values. Pages and ctrl-amount can be changed while running. Offset and Repeat defines which notes are played. /16 stands for the speed. Reset sets all notes and ctrl to zero.